Discussion in 'Grappling / Brazilian Ju Jitsu / Wrestling' started by Shakya, Sep 15, 2018. Since we know already that it is illegal to strike the back of the head in MMA bouts, and of course in wrestling competitions, does this mean that this is the 'chink in the armor' for grapplers in truly martial contexts? As the doctor and karate enthusiast in this video explains, strikes to this area of the body can be incredibly dangerous for the receiver (watch from around 7:00). Perhaps, during ancient or medieval - more brutal - times, the art of the double leg or single leg takedown was not indulged in so much due to this very reason? - It was incredibly risky if one's partner sprawls successfully? I look forward to hearing any opinions on this. there are many vulnerable spots on the human body. the key would be to capitalize on them and that is not easy nor a "chink" in any style. they apply equally to all styles. the front of the throat is less protected then the back of the head or neck. does that mean stand up should be avoided more then grappling? 2) In order to effectively attack the exposed spine of someone who leaves that opening you first have to stop the takedown. If you try to elbow the back of the neck while being taken down, it tends not to be effective. For evidence, look to all the MMA/Vale Tudo matches which occurred before the modern rules which banned attacks to the back of the neck. 3) Even if the person shooting leaves the opening and the defender stuffs the takedown, often the position created by the takedown defense doesn't offer a good angle for attacking the neck. Even if it does, the person shooting should either be bailing out or progressing to another attack once their first technique is thwarted. This means the window for attacking the neck may only be a split second. 4) If a grappler shoots for a lower-body takedown in such a way as to expose their spine, and you can stuff the takedown in such a way as to maintain a good base for striking and a good angle of attack, and take advantage of that opening before it vanishes - then yes, striking the back of the neck could potentially be a devastating fight-ender. I wouldn't count on it being an easy solution to pull off. 1) Ideal technique with a shot does not actually leave the back of the neck open. Eyes should be up and the head should be up (compared to the hips). - down, you will get hit behind the head. - up, you will get pushed on the forehead. 1. both arms to get your opponent's leading leg, you won't have another arm left to deal with your opponent's arms. 2. one arm to get your opponent's leading leg, you will have one free arm to deal with his arms. Also you are bringing your elbows up. Which is making life a bit easier. Thanks guys , really appreciate the thoughtful responses. I suppose I mean contexts like duels and such-like - where mortal injury is a recognised potential, and there are no, if very few, rules. the front of the throat is less protected then the back of the head or neck. does that mean stand up should be avoided more then grappling? Well, indeed, and therefore many martial arts styles seek to protect against throat strikes - recognising that it is a very vulnerable area. I am not necessarily talking about grappling in a sports context, here, I am talking about in a more martial context, and perhaps why it was not apparently as celebrated as a martial art as it is today - a martial art similar to those used for swords and spears in the past. Today, in our more developed societies, human blood-letting, and activities which cause such events, is apparently less common. you first have to stop the takedown. If you try to elbow the back of the neck while being taken down, it tends not to be effective. Yes, I've seen that, but what about hammer fist? before the modern rules which banned attacks to the back of the neck. Sure - was there a particular reason why they banned it? Was there a casualty? often the position created by the takedown defense doesn't offer a good angle for attacking the neck. Perhaps this is a matter of technique, however? Because in most grappling training scenarios no one is ever intending to strike to the back of the neck, and therefore no such positioning is sought? Even if it does, the person shooting should either be bailing out or progressing to another attack once their first technique is thwarted. This means the window for attacking the neck may only be a split second. Maybe. But what if people trained specifically for attacking that vulnerable spot when someone shoots for the takedown? I mean, in older, more brutal times, maybe the double leg takedown was considered as standing with legs akimbo waiting for a nut-shot, because if successfully sprawled, they were a gonner? I am not meaning to disparage the art here, I just can't understand why grappling was popular in the more ancient past, and yet today it seems to be even more celebrated. At the end of the day, whatever works in combat is appropriated - no matter with or without weapons, it is just the way evolution works, and I cannot believe that during all the brutal fighting that occurred in varying martial contexts that these techniques and methodologies were not already understood and thoroughly tested. So do you have an issue where you think double leg takedown was popular in ancient times and you dont get why, or do you think it wasnt popular and are trying to figure out why that changed? The second one, sort of. I think it was popular, but I don't get why it hasn't (until recent decades) apparently been celebrated as much as punching, kicking, and sweeping in thoroughly tested and developed fighting systems. It's not like their duelling rules were more strict 1000 years, ago, for example, let alone 2000 or 3000 years ago. And they had a vast array of fighting insights, and thus cunning techniques, which were just as ingenious and deep as those seemingly rediscovered in grappling today. Ok here it gets complicated. Unlike the demos the guy doing the grapple doesn't just stop. But continues to drive forward. The throw is in practice a combination of throws. So you shots are generally this arm flailing getting pushed backwards and if you get taken down you are going to know what a downward elbow looks like. So it is more like trying to swing down elbows in the middle of this. What makes you think takedowns, or grappling in general, wasn't popular way back when? I think it was popular, but I don't get why it hasn't (until recent decades) apparently been celebrated as much as punching, kicking, and sweeping in thoroughly tested and developed fighting systems. When the Gracies began promoting their art, for example, they defeated so many other fighters from well-established fighting systems - practitioners who had apparently been honing punches, kicks, and sweeps, rather than sprawling against takedowns, it seems. So I mean those established fighting systems didn't seem to be as concerned about the potential of double leg takedowns as much as defending against striking and sweeps, for example. 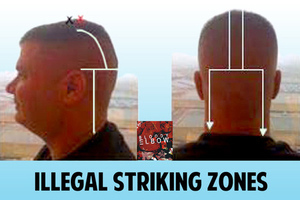 I think there must be a reason for that - and perhaps it is because of strikes to back of head? In the video in my first post, for example, the doctor talks about a karate kata that spins a person around and then strikes to the back of the head. So such attacks were known to the Japanese fighters, and I am sure to fighters everywhere else, also. Such a kata would be deemed pointless to sport MMA fighters, however. To medieval duellists and those who wished not to be robbed, murdered, or raped by bandits, however, it could have been invaluable. Remember that the original ufc, where the gracies proved the effectiveness of bjj, had very different rules than today. It wasn't split into rounds, and basically nothing was off limits, so it wasn't a rule set thing. Also, the 20th century is very different from 'ancient', in terms of when those musical anything goes types of fights might have existed. During the long scramble that ensues from 1:00, for example, it seems that there is plenty of opportunity for a hammer fist to the back of the head. Would you agree? No, sure. I am not saying it is about the rules, I am thinking it is more likely about medieval or pre-medieval practicalities. The non-bjj practitioners' recent lineages just hadn't been concerned about ground game for some reason, but now it is such a big deal. Therefore I think that some key piece to this jigsaw puzzle must be missing. Yes, society began to frown more upon human-blood letting and gladiator style events in general, and so traditional martial arts became less relevant to the average civilian who did not intend to go into battle or even manage their own physical conflicts. That would be useful . At a guess, I would think that BJJ was developed more for dealing with weaponless untrained street thugs who had 'beef to settle', but wanted to do it without causing a gang war - like break-dancing battles did in NY city in the 60s and 70s (involving U.S. Latinos). But then again, I am no expert on this stuff. If your opponent moves in with this kind of momentum, your hammer fist won't be able to have any effect on the back of his head. Momentum can be stopped though, right? Perhaps he would not launch himself in like that so readily? There's a reason takedowns like that aren't recorded as popular. Basically, anywhere it was popular in 'ancient times' they didn't have the ability to record minor events. As record keeping is number 7 on the list of symptoms for societal advancement, it means that number 4 (developing the ability to manufacture glass) came first. As we all know from the SD discussions on this very site, as soon as glass is present it's going to get broken and liberally strewn around on the ground. So, ground grappling would have fallen out of favour (except in controlled competition environments) just before records were kept - because nobody wants to roll around in broken glass. ...and perhaps that connection is returning today more and more?